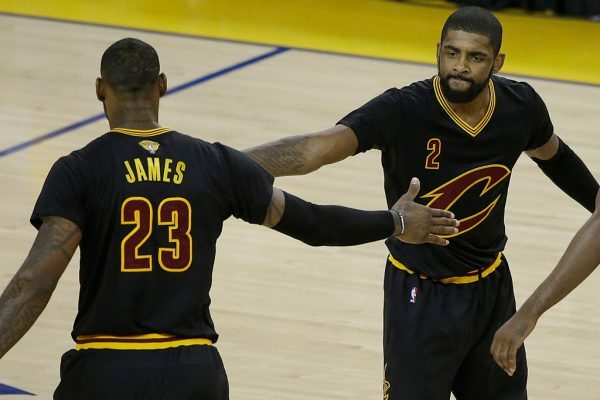 The connection between LeBron James and Kyrie Irving helped the Cleveland Cavaliers capture their first NBA title last June. That chemistry, forged over the past two years, has led Cavaliers head coach Tyronn Lue to compare the duo to the Los Angeles Lakers’ legendary pair of Shaquille O’Neal and Kobe Bryant. Kevin Ding of Bleacher Report notes that Lue is qualified to offer the comparison, having spent three seasons as a player with the Lakers when O’Neal and Bryant were on the team. The last two of those years ended with Los Angeles winning back-to-back titles. Due to that perspective, Lue detects some of the same traits with James and his former teammate, O’Neal, and Irving with Bryant. “It’s like it’s the same,” Lue said. “Shaq was already established and was older than Kobe, and he was the most dominant player in the league. And Kobe was always striving to be better—to be the best player ever. That was his goal. Lue came to that realization about Irving’s progress when the sixth-year guard connected on the biggest basket in Cavs history: his three-pointer in the final minute of Game 7 of the NBA Finals. Prior to that, Lue had issued Irving a challenge. Irving’s mentality has been helped by frequent conversations with Bryant himself. One unique connection the two share is that both of their first NBA titles came after they got a late start to their season due to injury. “They have a great relationship, LeBron and Kyrie. LeBron’s been like a big brother, bringing Kyrie along, teaching him how to be a professional and take care of his body, saving energy, eating better,” Lue said. “Things like that that Kyrie didn’t have before LeBron got here because they had a young team. Lue expects Irving to build on his success in the years to follow. James and Irving get a chance to defend their title on Oct. 25, when they collect their championship rings before taking on the New York Knicks in the 2016-17 season opener.